Looking north from Mt. 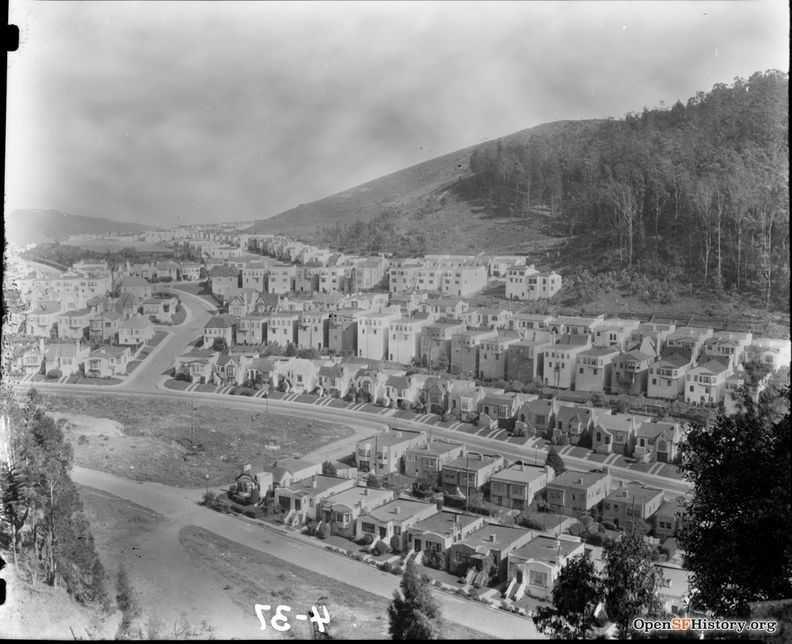 Davidson across what is later Miraloma Park, Twin Peaks in distance, 1903. Containing Mt. 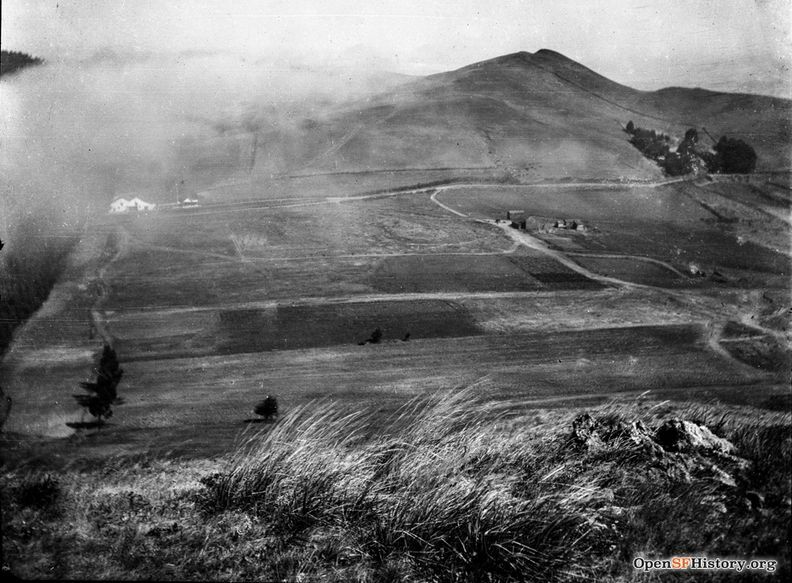 Davidson, the highest peak in Rancho San Miguel and San Francisco, this 175.27 acre tract was offered by the Residential Development Company in 1914. 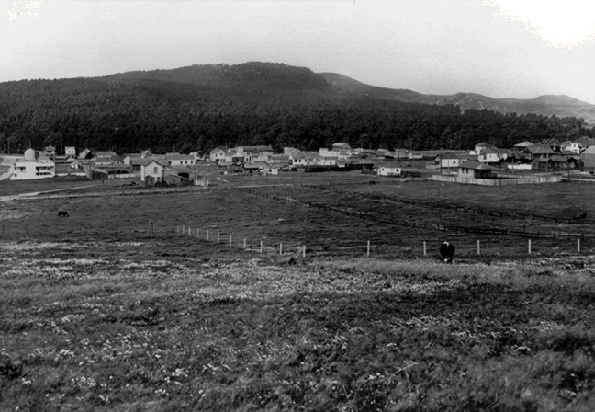 It was not until the mid-1930s, however, that this area fully developed. The stockholder report dated August 10, 1914, stated two trails developed by the RDC were already popular to pedestrians and equestrians. The report continued, "When conditions justify it, a survey will be made of at least one of these proposed roads leading to Mt. Davidson, and if the cost is not too great it is our opinion that the construction of one of the scenic avenues might be undertaken. Assistant City Engineer, Mr. Ranson, has requested that this peak be reserved from sale as the City will in the event of the acquisition of the Spring Valley Water System, need several acres of land at the summit for a future reservoir site." 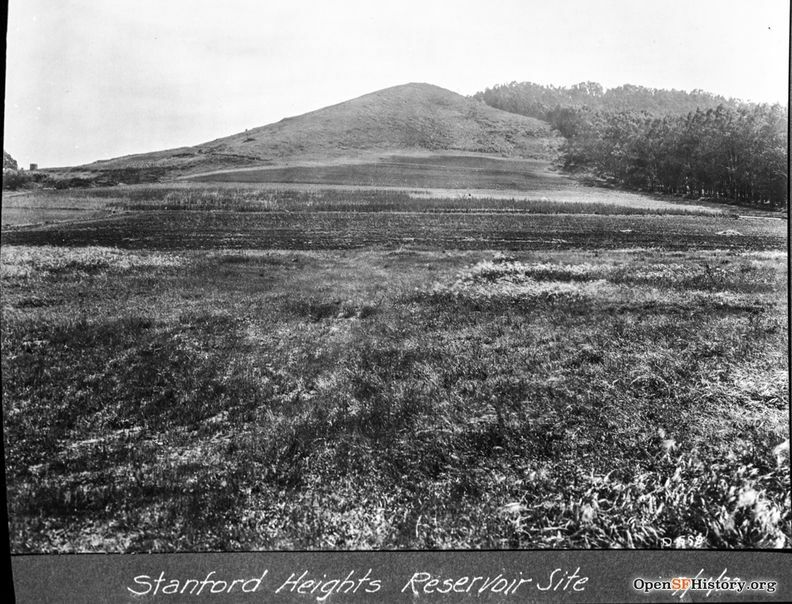 Future site of Stanford Heights Reservoir, May 11, 1923, from the Spring Valley Water Company files. 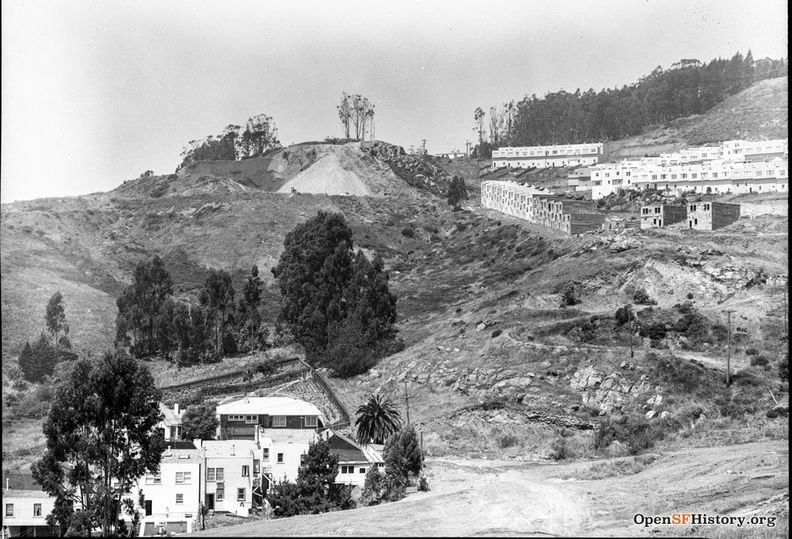 View from above Foerster Street showing Molima Construction and bulldozing Sherwood Forest, c. 1953. 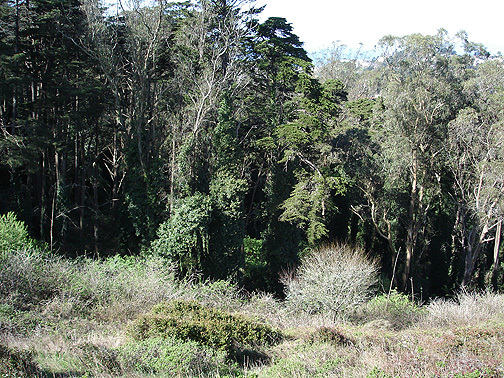 Such road development never happened largely due to the efforts of State Parks Commissioner Madie Brown and the Parent Teachers Association of the Commodore Sloat School. They saved the forest creating Mt. 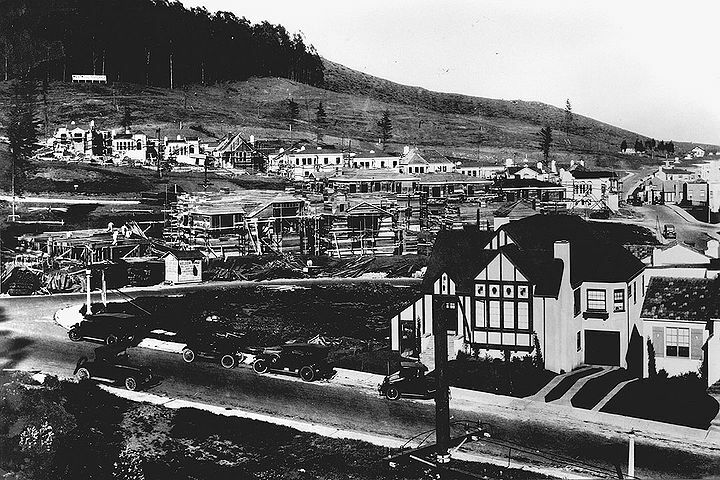 Davidson as undeveloped space which eventually became a city park of 38 acres. It was dedicated on December 20, 1929. Glenn Gullmes, coordinator of the last several Mt. Davidson Sunrise Services, explained the history of the cross on Mt. Davidson. "A wooden cross was built atop Mt. Davidson in 1923, coinciding with the first Easter Sunrise service on April 1 of that year. "The 103 foot permanent cross that now stands at the center of the park was inspired by James G. Decatur and brought to fruition largely through the efforts of A.S. Baldwin, Clarence F. Pratt, and Rev. Homes K, Pitman (program director of 25 Easter sunrise services). "In a transcontinental dedication ceremony, President Franklin D. Roosevelt flipped a golden telegraph switch in Washington which originally illuminated the cross on March 24, 1934. By 1970 vandals had destroyed the automatic lighting system. 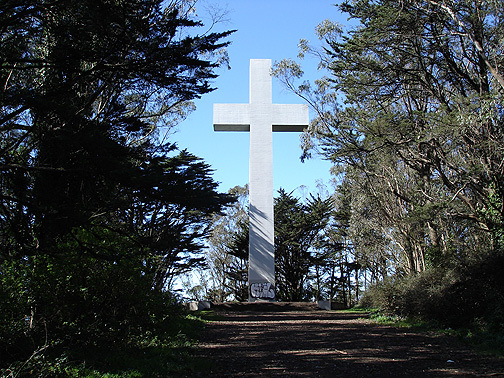 Since 1987 there has been community controversy over the religious symbolism of the cross, i.e., separation of church and state, and freedom of religion. In 1997 voters approved the sale of the cross to an Armenian heritage association, who have promised to maintain it as a Christian shrine. 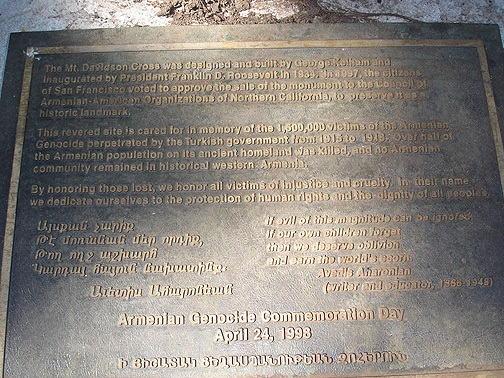 Plaque commemorating the Armenian genocide in Turkey, 1915-1916, installed in 1998. Today's trails circling Mt. Davidson traverse a native plant ecosystem similar to the plant environment known by Jose Noe and even George Vancouver. 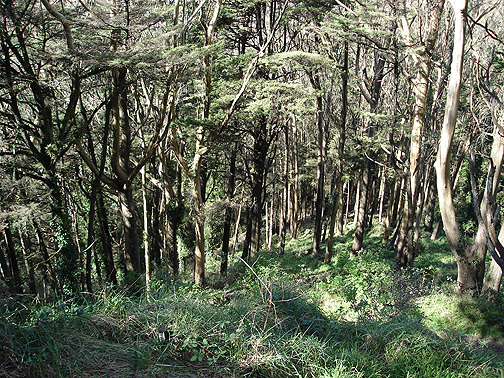 Sutro forest, planted in the late 19th century, supplanted much of the native eco-niche that once filled the hilltops. The value of such a remarkable experience when hiking Mt. Davidson's trails is impossible to explain with words. One is aware one has walked back into time. Their there is the exhilarating panoramic view from the top of Rancho San Miguel that is spectacular. This highest point closest to the stars was named for George Davidson who surveyed and named it Blue Mountain in the 1860s.